Switch over to island time with a stay in this gorgeous ocean view suite at the Maui Banyan! From nearby restaurants, easy beach access, and resort perks like a shared pool and hot tub, you'll have everything you need for the perfect Hawaiian getaway. 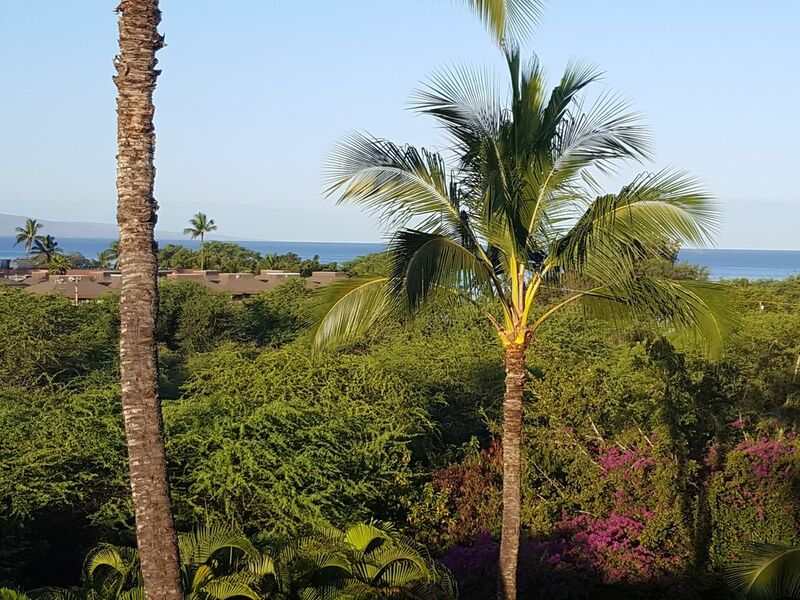 Your suite enjoys a view of the ocean and Haleakala over the palms, but fun in the sun is closer than you think. The soft sands and warm waves of the Kamaole beaches are only a few minutes across the street, while restaurants like Moose's, Fred's, and Coconuts provide delicious meals on the way back. Located on the quiet side of the building, overlooking the tropical Maui Banyan plantings and native vegetation away from the garage and street noise, relaxation is everywhere. Back at the resort, pass the time soaking in the shared hot tub, swimming in the shared pool, or working up a sweat with a game of tennis. Afterwards, return to your suite and enjoy the same beauty and tranquility that artist Karen Lewis experienced during her stay at the Banyan. Her artwork graces the walls, and you'll also have free WiFi, a flatscreen cable TV, and a kitchenette with a minifridge, microwave, and coffee maker. Save your dates now and embark on the Maui vacation you deserve! Enjoyed our stay in unit. It was walking distance to beach and amenities. A fairly nice distant view of ocean. The place was exactly what was stated; right across street from beach and it had 2 pools and 1 outdoor whirlpool / hot tub we used. In our King bed, we slept great. Easy access to snorkeling trips with 7am departure. Small but charming with nice ambiance and amenities, everything you need including straw mats, fantastic location, quiet and private with stunning view. Definitely a great choice! We enjoyed our stay. Location and parking cannot be beat. Really close to beaches and restaurants. Great pools and convenient amenities. This is a great studio efficiency for a great price. Walking distance to both Kam 2 and Kam 3 beach parks. The room is updated, clean and setup with sink, fridge, dishes etc. We also enjoyed the beach chairs and snorkel gear in the closet. We recommend Fred's for fresh and tasty Mexican on the porch overlooking the ocean. Aloha!